After being available for over 11 years, a new glitch in Ocarina of Time has since been discovered, this time giving the player the ability to clone heart pieces and hypothetically get an infinite amount of them. The glitches requires the use of the hover glitch and when in the Lost Woods you can use it to repeatedly clone the Skull Kid. 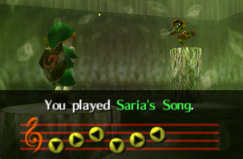 After cloning him several times, you can then play Saria’s Song on the Ocarina several times and then speak with the Skull Kid and each time you will be given a piece of heart! This hypothetically means that you can keep cloning him over and over and just get more and more heart pieces. However, the founder of the glitch discovered that the game really starts to lag up when you’ve cloned the Skull Kid enough times and will eventually freeze. So his next goal is to try to get beyond this error and go for an infinite number of heart pieces. You can watch the video by clicking here or you can just click read more to see it embedded right here at Zelda Dungeon.